I awoke with no bear sightings…so the evening was a success. I stopped by the lighthouse at the campgrounds once more, but the lady who runs it wasn’t there at 9:30 am, so I just marked it off as another virtual cache, but didn’t get to take the tour. I met Arnie and Judy at the campgrounds the night before. They were red hats and helped with pointing out the different hookups, so I talked to them before heading to Rochester. Believe it or not, there is a 100-foot waterfall in the middle of town. 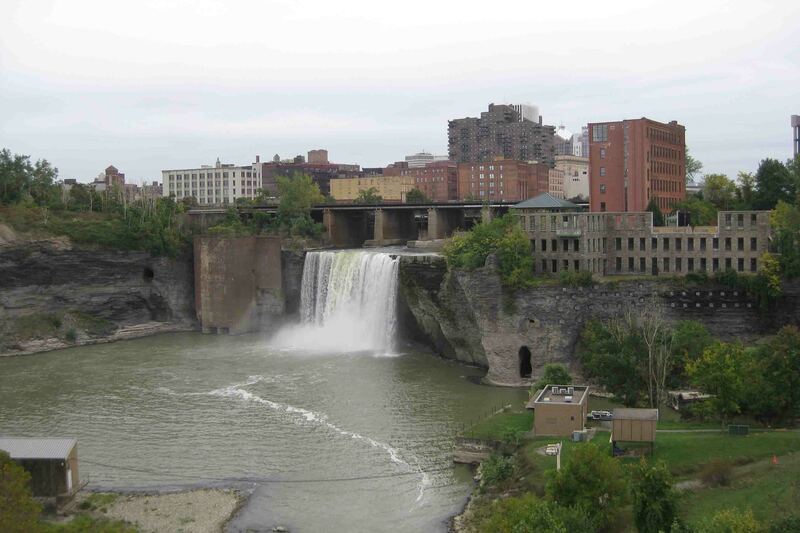 High Falls, on the Genesee River, can be found in Brown’s Race Historic District, and lucky for me was another earth cache. During the early 1800s the river supplied power to several mills and factories in the area, and Rochester became known as the Flour City. After the decline of mills, Rochester became known as the Flower City. 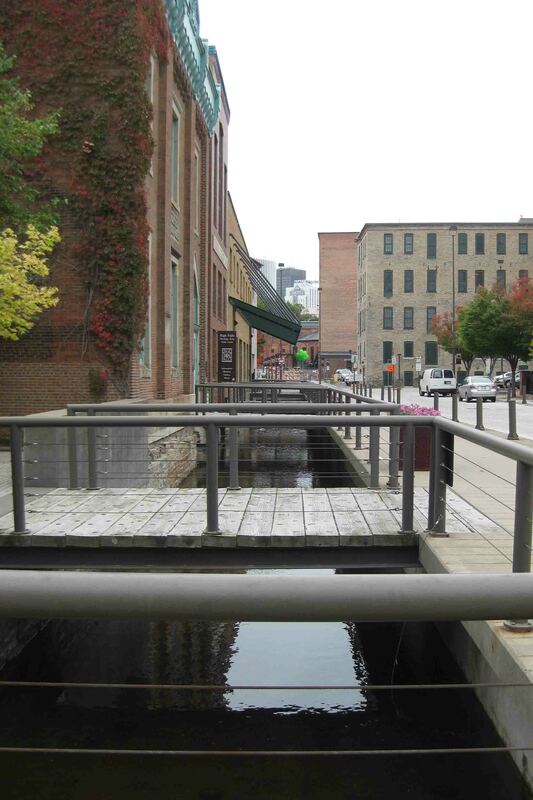 Brown’s Race, a power canal, was constructed in 1815 and can still be seen today in the Historic District. The canal; 1,221 feet long, 30 feet wide, and 5 ½ feet deep; diverted water away from the falls and spillways and funneled the water from the race through the mills. 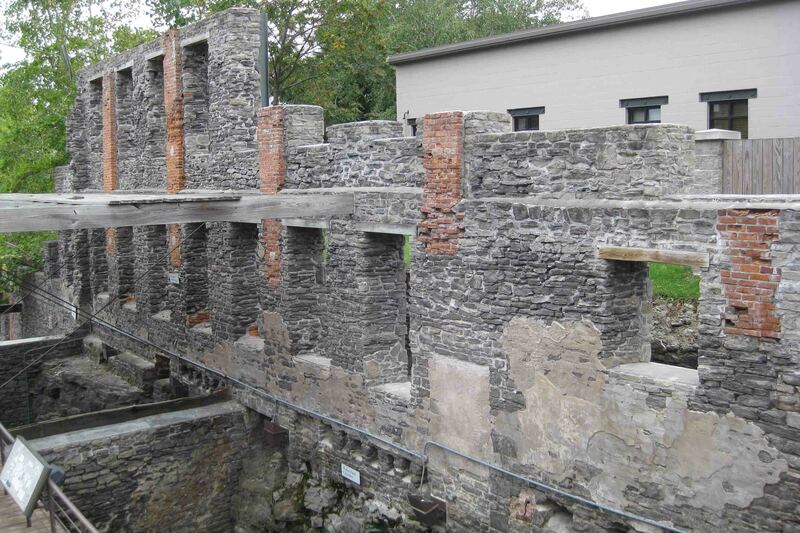 Next to the canal was the Triphammer Building built as a forge in 1816 and operated as a tool factory. A large hammer (the triphammer) was raised by waterpower and dropped to forge wrought-iron tools. Later the building was used to build fire engines and in 1860 it was purchased by Junius Judson, inventor of the steam governor used in locomotives and ships, who added a water turbine. The building burned in 1977. 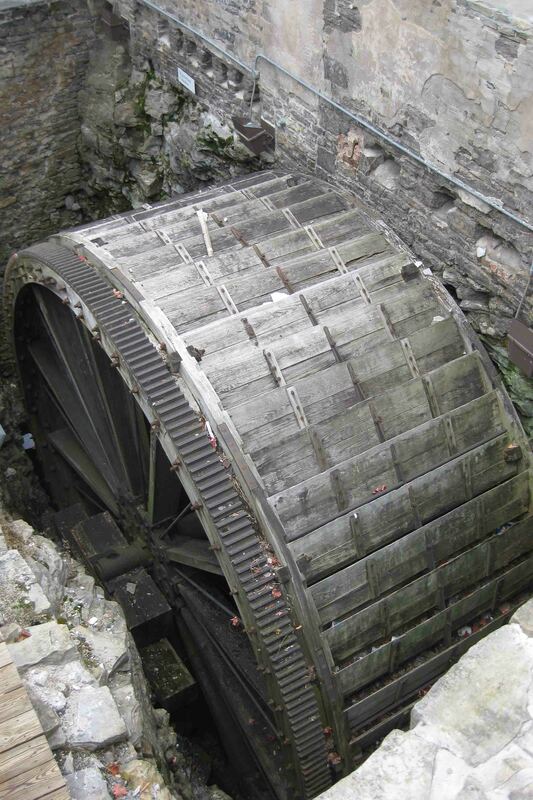 Workers who were clearing the rubble uncovered a basement room with the water wheel and the shaft to the water turbine. The remains provide the layers of Rochester’s history. Before I left the Historic District, two interns interviewed me about the banks and the new banking laws…haha. They wanted to know if I was happy with how I was treated the last time I opened a checking account, how the bank communicates with me, if the communication is relevant, and who I thought would benefit the least with the new regulations. Hmmm…I wonder. Rochester is also home to Eastman Kodak. 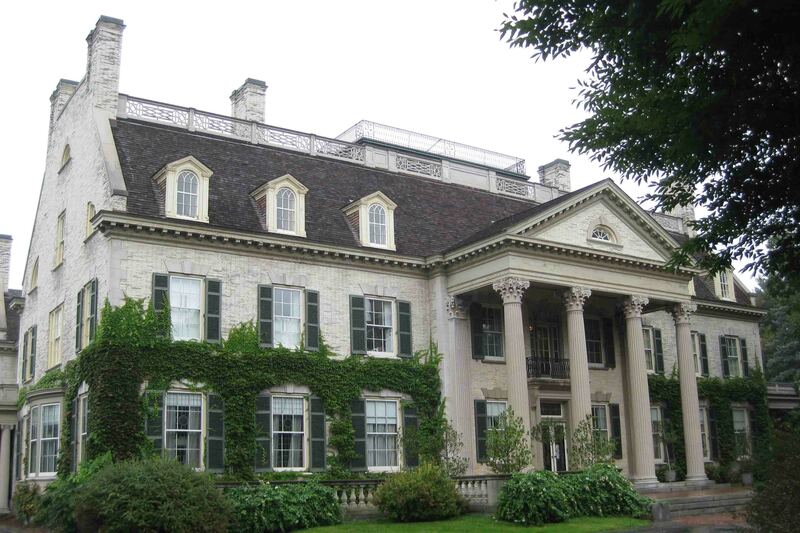 Eastman Kodak’s office building is walking distance from the falls, and George Eastman’s 50-room Colonial Revival Mansion is only a few miles away in the East Avenue Historic District. It now houses the International Museum of Photography and Film. I stopped by, but as with most museums, it was closed on Monday. I bet it is fantastic. 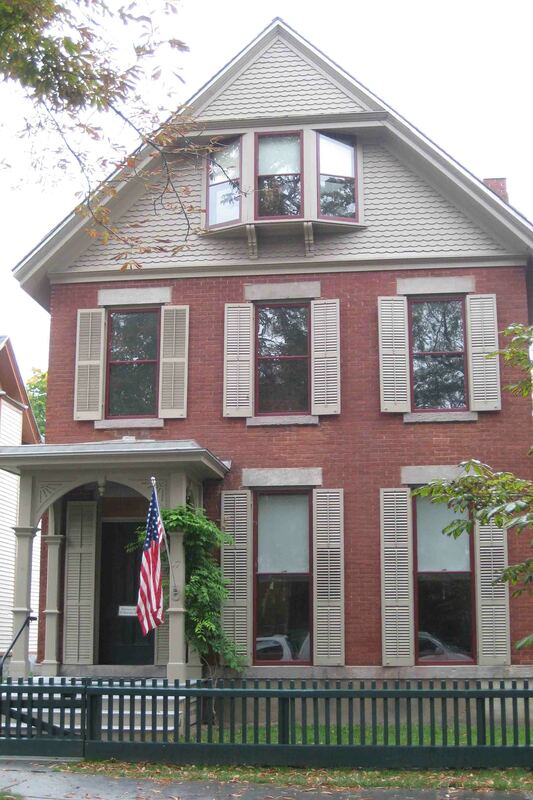 I also made a quick trip to the Susan B. Anthony House, as I’ve always liked the dollar coin, and expectantly settled for a picture of the house as it was closed too. I maneuvered the downtown area back to the Seaway Trail that was peppered with apple and pear orchards, fields of wild flowers, and crops with backdrops of lake views or green forests sprinkled with red, yellow, and orange from the changing leaves. 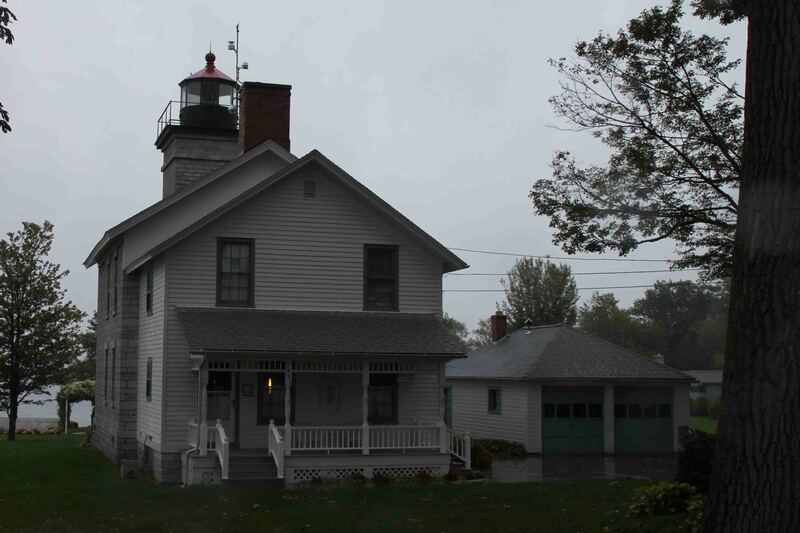 Thirty miles later I arrived at Sodus Bay Lighthouse. According to Reader’s Digest, “It is said that slaves escaping via the Underground Railroad longed to see the Sodus Light, the last way station on their 1,000 mile trek” before they sailed across to Canada. Currently, it includes a maritime museum, and it was closed as well! At least I saved some money on all the entrance fees I guess. Your mom and I have been reading your blogs (she is showing me the ropes, as usual) . what an exciting adventure you are on ! It issofun reading your ‘diary’ each day….it is like reading a aa good book about American history abut bettter door your personal and often humorous stories. We will be staying tuned, and keeping yup in purr thoughts looking forward to your next blogeach day. Your mom is here visiting and being my nurse and dearest friend while I recuperate from a little ‘tuck’. She misses u so much and smiles with much pride at the mention of your name….which is often ! Fluff just typed you a nice long note, but I don’t think it went through. Guess she will try again later. Rochester sounds interesting. I bet the fall colors are beautiful. Are you having cooler weather? So glad to see that Alice (my Breen friend) sent you a post! route, happenings and people along the way….also Scout and Petie, of course. Hope Scout is feeling better tomorrow. Stay warm, smooth travels and happy trails….. we’ll be tuned in, and looking forward to your notes. I am catching up with you…you have been very busy. I got to day 8 and had to skip to today…will catch up though! The pictures and narrative are great…don’t forget to smell the roses. I am glad you are meeting folks on the road….but I must admit that I think I recognized one or two of them from Americas Most Wanted…I could be mistaken. If you go near Saratoga, I have a good friend there Karen Goldberg and her hubby Bob. They are on FBunder Bob Goldberg. Tell them Char sent you. Don’t have their phone # or I’d give it to you.